Just got back from the second of my small bike trips. 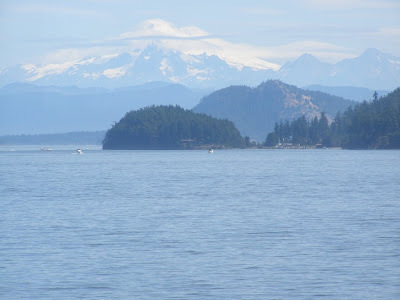 Orcas Island via Anacortes and Skagit Valley. Most of the charm was getting there on some quiet roads through Edison and Bayview State Park. 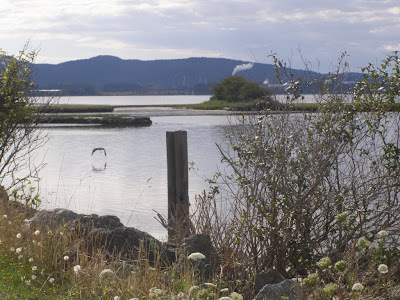 Above picture taken from Padilla Bay bike trail has everything from a blue heron to the Anacortes Refinery. The Journey is really the destination. Several bakeries in tiny Edison offered nice smells and treats. 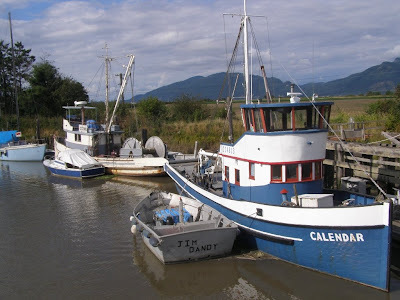 Old boats just sitting in the tiny Samish River. Pedaling through Skagit was nicer than the "destination" Orcas Island, itself. Roads on the island are kind of narrow and busier. I've noticed this, when I go to the Island. Yes, San Juan Islands are considered a bicycle destination, but really, some of the mainland is better. Many bicyclists go to Lopez, rather than Orcas. It's flatter and more rural, but there doesn't seem to be many attractions there. Just riding around, which I do all the time anyway. Orcas is OK; just a bit hectic. One of my favorite attractions has been the Doe Bay Resort, on Orcas, with it's clothing optional hot tubs. Haven't been there for a while, but paid a visit. 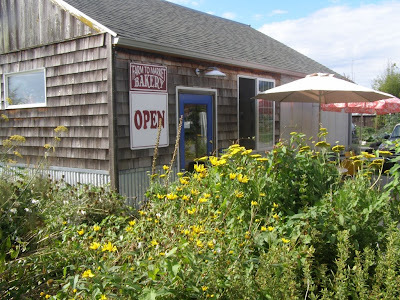 Over the years, Doe Bay has gradually evolved to a bit tidier, but more expensive place. The clientele seems to have changed at the tubs, but it's still the home of friendly conversation. I used to enjoy the young hippie kind of energy that was there. Now that it's gotten more expensive, it seems to be drawing an older and more financially established crowd. One might be more apt to run into brokers than traveling folks right out of college. Still, I had a good time, but it's not what it was in years past. Tubs are lined with a more comfortable surface that looks like slate. The deck is a lot wider and more comfortable and most of the people are a bit wider as well. Coming back on the ferry, one gets a better view of Mount Baker (if it isn't cloudy) than from Bellingham. At least with a zoom lens. Of course, I don't want to attract too many people, and cars, with images of Mount Baker like you'd find in coffee table books. 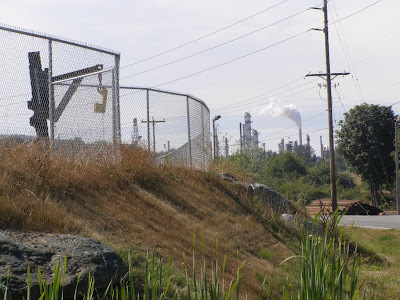 Riding past the oil refineries of Anacortes also offered some interesting images.